In the face of the crippling of the Voting Rights Act by the Supreme Court, Americans are faced with a choice: to use their right to vote or to risk losing it in the future. Factions of our political landscape have shown themselves to be willing to disenfranchise those who don’t support them electorally and, with the crippling of the Voting Rights Act, it is now easier for these factions to implement disenfranchising laws. 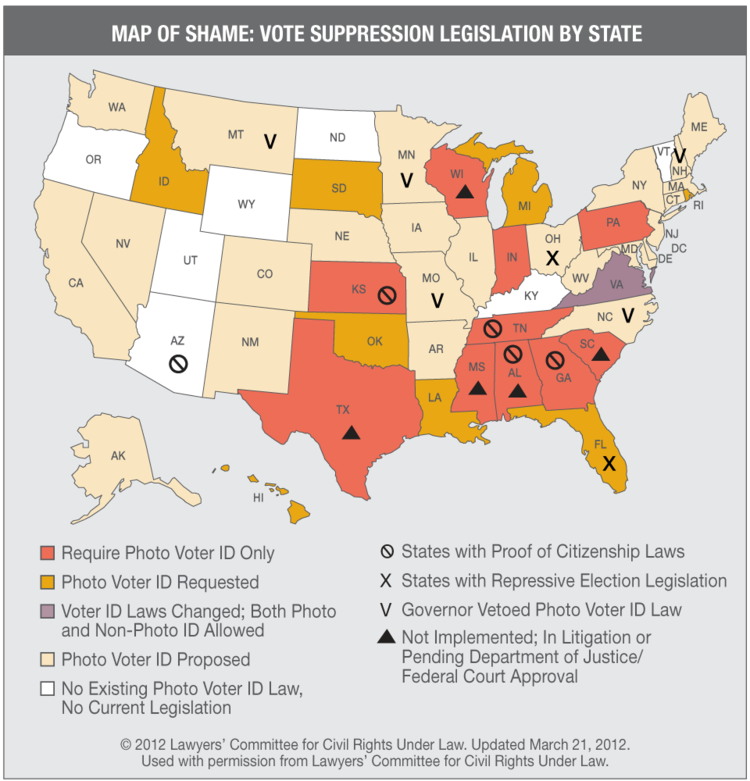 During the 2012 election cycle we saw Republican politicians attempt to implement dozens of anti-democratic voter laws which would disenfranchise voters. These laws varied in their specifics—from the Florida voter purges, where voters were simply struck from the rolls, to the ubiquitous “voter ID” laws, which mandate a type of ID for voting not held by large portions of the population—but they all served to target those who don’t traditionally vote Republican (ex. racial minorities, students, poor people, etc.). It is important to note that, while the most recent attempts to disenfranchise voters have been by the GOP, voter disenfranchisement is an issue which transcends partisanship—it can be attempted by politicians of any political party and must be guarded against by all who want to live in a truly democratic state. 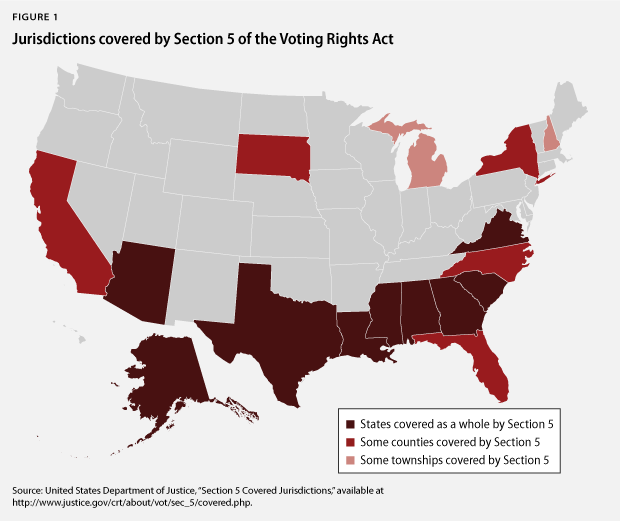 Of the measures which have been used to protect against voter disenfranchisement, the Voting Rights Act has been the most successful law in preserving the voting franchise. Unfortunately, the Supreme Court has crippled the VRA through eliminating its crucial 4th section. The now-inactive section 4 of the Voting Rights Act created the formula for the “pre-clearance” provision of the 5th section of the VRA; this pre-clearance forced states and districts with histories of voter disenfranchisement to clear their changes to voting laws with the federal government before implementing them. Such pre-clearance would allow disenfranchisement to be stopped in many areas before it ever took effect and caused damage. 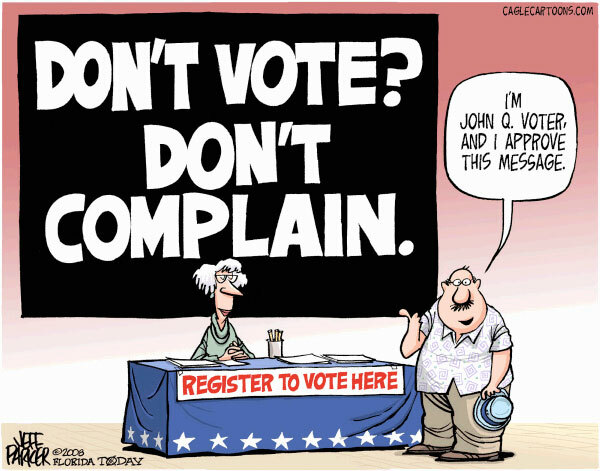 With the crippling of the VRA, the field is open for all varieties of voter disenfranchisement to be implemented. It may be struck down in the courts, but the damage would already be done in many cases (the laws may be struck after an election and the voter disenfranchisement would be irremediable). If you think that voter disenfranchisement will not affect you because you aren’t black, please think again. When modern voting disenfranchisement is boiled down, it is no longer simply racism but a function of political parties retaining power through repressing demographics that don’t vote for them. Under GOP governance, students, racial minorities, and poor people have seen their voting rights threatened not because of simple bias, but because of political strategy. All of those demographics are ones which don’t support the GOP, so the GOP took the immoral, yet rational, step to maximize their electoral prospects by disenfranchising those who disagree with them. Racism is undeniably a component of why the GOP has restricted racial minority voters from voting, but it is not the primary reason today. The GOP realizes that black Americans don’t vote for them and many GOP operatives are willing to subvert democracy if it means political victory—rather than having to change their ideas to attract more people, they would rather simply stop those who disagree with them from voting. In an amazingly honest statement, Texas Tea Party Leader Ken Emanuelson admitted that “The Republican Party doesn’t want black people to vote if they are going to vote 9-to-1 for Democrats.” This statement only supports the GOP contention that it isn’t racist—unfortunately for them, it also props up the idea that they simply care more for power then democracy. Eventually—regardless of whether you are Democrat or Republican—you will end up in a situation where the party in power doesn’t get support from the demographic which you are a part of. Perhaps some Democrat will decide to start attacking the right of rural Americans (a reliable GOP demographic) to vote by shutting down polling places in rural areas. If you stand by now and let voting protections get crippled, there is the very real possibility that your rights will be taken at that future time; by standing by now and letting others have their franchise taken, nobody will have sympathy with your plight when it is you who is on the receiving end of such discrimination. Stand up and vote for politicians who protect the right to vote, lest you face a time where you have your own rights taken in the future. There is a very simple thing that you can demand of your political representation to protect your and your neighbors’ right to vote: demand that they extend the 5th section of the Voting Rights Act over the entire country by updating the 4th section of the VRA to include every voting district. In short: Use your voting franchise to protect everybody’s right to vote and the status of our country as a representative democracy, or stay silent and risk losing your right to vote once the political winds shift. Great post. I wrote about the history (and future) of voter discrimination over at my blog (http://historyforfree.com/2013/07/02/the-voting-rights-act-voter-discrimination-and-the-shelby-county-v-holder-decision/) as well. I think we will continue to see gerrymandering and various forms of voter suppression until Congress makes a new law to replace the sections of the VRA that were thrown out. Unfortunately, I do not see that happening in today’s political climate. Lastly, It is a shame that the Shelby County v. Holder decision was pretty much ignored after the gay marriage rulings. Obviously those rulings were important, but this one has a potentially deep impact.